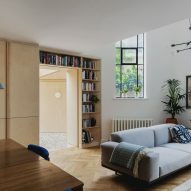 Located in the neighbourhood of Dalston, the flat has been extended by architecture studio IF_DO to create a "lofty, dynamic, and unexpected space". 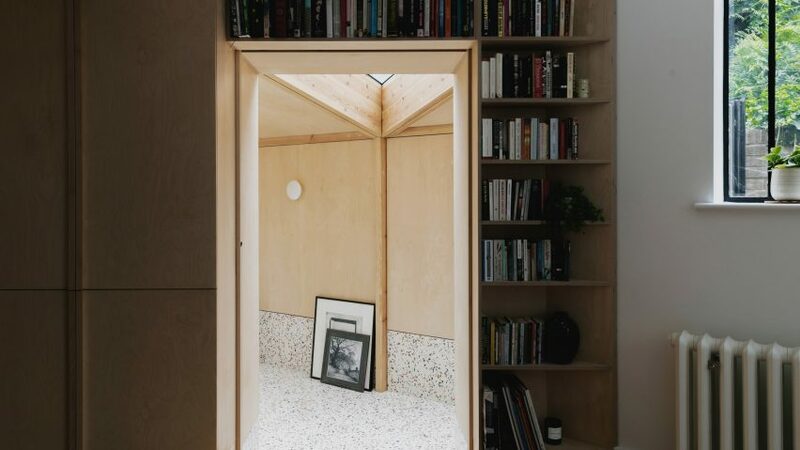 "[The clients] wanted to create something truly special – their brief was not only to create a much needed second bedroom and study, but to also enhance the eccentricities and add value to the architectural character of the building," Sarah Castle, co-founder of the studio, explained to Dezeen. 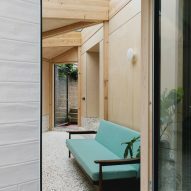 Taking over a dark and disused courtyard, the 73 square-metre extension features a birch timber roof that's punctuated by triangle-shaped skylights. 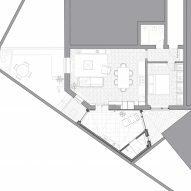 The extension also accommodates a small bathroom, which is accessed via a door that's subtly embedded into the wall. A new countertop has also been created from the colourful terrazzo that's been used in the extension. 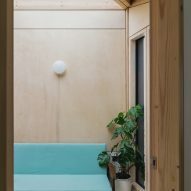 IF_DO was set up in 2014 by Sarah Castle, Al Scott and Thomas Bryans – previous projects by the studio include a sixth-form college in Surrey, which is wrapped around a planted courtyard, and a mirrored events pavilion on the grounds of John Soane's Dulwich Picture Gallery.